By licensing and downloading SQLScout, you agree to IDEScout’s End User License Agreement. The latest version of SQLScout is 3.1.2. Detailed changelog can be found here. 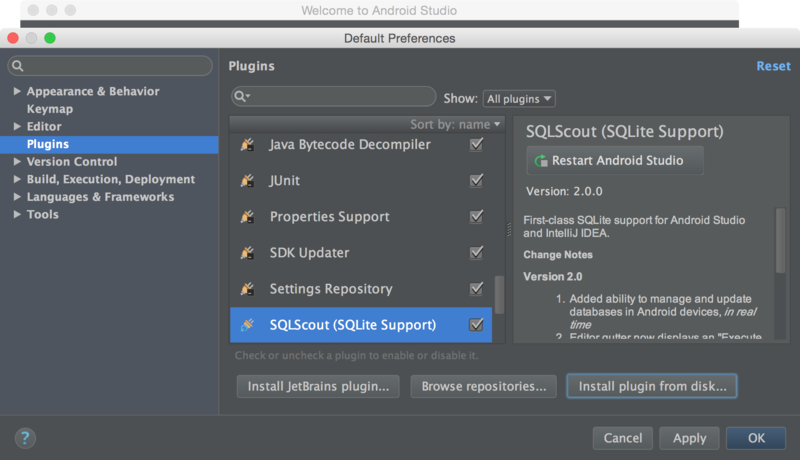 SQLScout binaries can be found at the JetBrains Plugin Repository. Open the “Settings” (on Windows and Linux) or “Preferences” (on Mac) dialog. Select “Plugins” from the list on the left side. At the end, you will be prompted to restart the IDE. After installing SQLScout, during and after the trial period, the IDE will prompt you to activate a commercial license of SQLScout. Click the link “Activate SQLScout”. The dialog “Activate SQLScout” will be displayed. Please enter the license key you received (via email, after buying a commercial license) and press the “Activate” button. SQLScout will validate your license key. Once validation is complete, you will be able to use SQLScout.